Laura and I were recently contacted by Jacqueline Topacio, the casting producer for Pilgrim Studios. Jacqueline is looking for prepping families who may be interested in competing in a Survivor-style show. I’m a casting producer for a new television show about families that are preparing for any kind of global disaster. 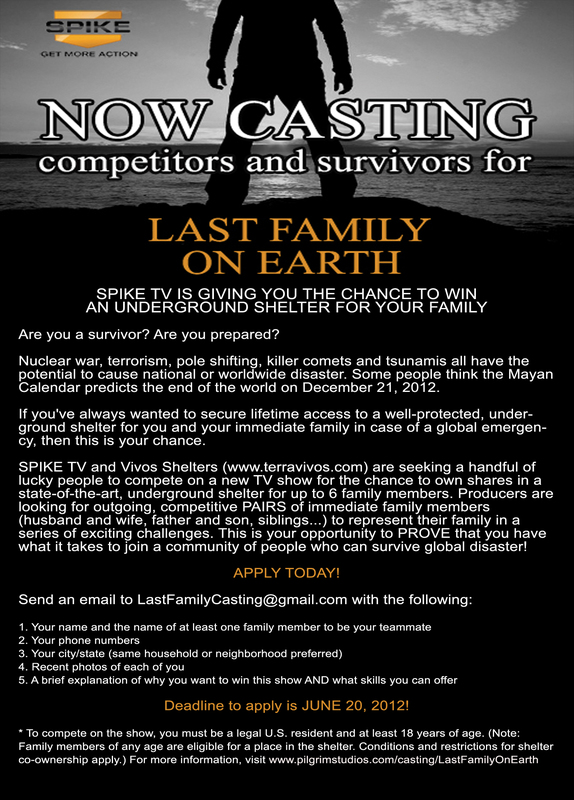 SPIKE TV and Vivos Shelters (www.terravivos.com) are seeking a handful of lucky people to compete for the chance to own shares in a state-of-the-art, community underground shelter for up to 6 family members. This opportunity is not something that our family would consider doing, however I thought I’d pass the message on to you just in case you’re interested in learning more or even entering into the competition. Are you interested? If so, why? If not, why not? Nooooo! Please don’t anyone do this. If you put yourself on television, you are opening yourself up to the entire world. Everyone will know who you are, where you are, and what you have. It isn’t worth the prize that the govt would just turn around and confiscate in the event that martial law were declared. I agree, hecatesmoon and americuhh. It’s definitely something that my family is not interested in doing. There is no real upside for us and the downside is tremendous. Nevertheless, I agreed to pass it along for others to make their own decisions. We didn’t receive any compensation for passing it along. Not interested. 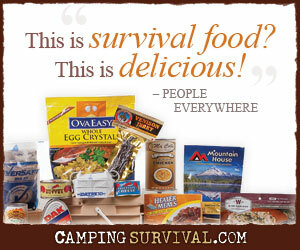 Who needs shares in a community underground shelter? No, I would not and could not compete in a “series of exciting challenges” in a last survivor scenario for some prize that does not have any appeal. Betcha Spike TV has a heck of a contract limiting their liability for injuries. Hi, every time i used to check website posts here early in the daylight, as i like to learn more and more.